"COASTAL CHARM" at Seacrest is the BEST!!! Welcome to "COASTAL CHARM"...our 'GULF FRONT' condo located at Seacrest Condominiums in Gulf Shores, Alabama. Seacrest is located in the heart of Gulf Shores, just minutes away from Orange Beach, Alabama and Perdido Key, Florida. This is probably the most luxurious and best value priced one-bedroom gulf front condo you can find in the area. Half of our business is repeat or referral, we have been renting our home out since July 2003. We keep our rates low and as local residents, we see to it that our condo is in great condition at all times. We've included many extras rarely found in beach rental condos to make our condo special and enjoyable for our guests.We have a library of guidebooks and area information in the condo for you to use. No expense is spared for your well deserved vacation. Our professionally decorated condo is perfect for couples or a small family.The layout is great for kids. There is a bunk area in the hallway (kids love the bunks!) that can be totally shut off from the rest of the unit. There is a pocket door between the bunk area and living area. A private bedroom with a queen bed, is located off the hallway. Why pay for a two bedroom condo, when all you really want is a place where you can put the kids to bed and close a door? The unit will sleep up to four comfortably. Reserve your week early so you don't miss out on staying in this popular condo. COME FALL IN LOVE WITH GULF SHORES, AND COASTAL CHARM!!!! WHY STAY AT "COASTAL CHARM"? 'The 'SWING' was a nice addition...this was our second time here at #803! *NO STUDENT RENTALS-MUST BE 25 YEARS OLD! *NO PETS (local kennels available)!!!! *$110 Cleaning Fee (not included in rates). *13% Taxes not included in rates. *$200 Reservations/Security Deposit (Refundable after inspection). We are local residents and love it here on the Alabama gulf coast. Jack is a local real estate agent here at the beach and he would be happy to help you own a piece of paradise too! Linda is the owner of Coastal Charm Interiors...located in Mobile, Alabama. As a decorator and shop owner, Linda keeps the condo updated with latest trends. She is also a lifestyle blogger...her blog is COASTAL CHARM. Perched on the eight floor, Seacrest #803 is in the perfect spot to view all the action at the pool and the beach. Sunrises cast gentle lighting across the sugar white beaches and sunsets are viewed with delight from your private balcony. Open up the glass door to your living room and allow your senses to be awakened by the gulf breeze. Direct view from living area/kitchen. Direct view from balcony and living area. 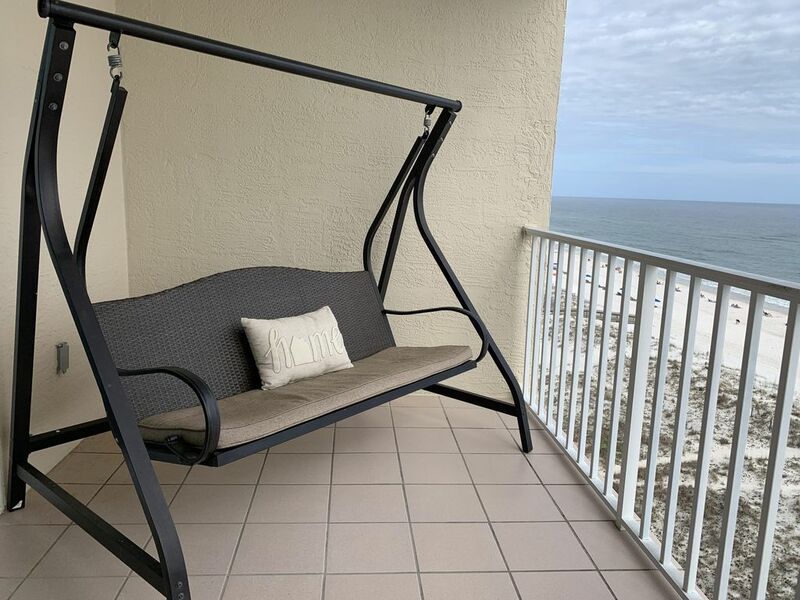 Swing located on beachfront balcony...also two chairs/table. Nice, comfortable condo for 2 people. Good location. Owners returned call promptly when I had a question about the internet. Would definitely stay again. The condo had a gorgeous view of the Gulf. We really enjoyed the porch swing and listening to the surf in the evenings. Would definitely stay here again. This is our 2nd time to this unit and will not be our last!!! Perfect location and clean and charming! Very cozy condo. Will definitely return. Great rate. We had a great view of the Gulf from both the balcony and the living room area! We especially enjoyed the swing on the balcony in the evenings. We seen dolphins multiple times and were even treated to a few jumping from the water without having to go on a dolphin tour! We had everything we needed in comfortable surroundings. I talked to Linda both on the phone and by messenger. She was always quick to answer any questions I had and always made sure we were enjoying our stay. I highly recommend this as your place to stay while visiting the Gulf. We're definitely planning on staying here again! *Additional Info About Rental Rates Departure Cleaning Fee $110.00 + Tax Administration Fee $75.00 Deposit $200.00...**This is collected by the owner at the time of booking our beach home**…**It's refundable after departure/inspection** This is a Saturday to Saturday rental - 7 nights only. One Parking Pass is included with rental amount. Second Parking Pass is $15.00. Signed Owner's Rental Agreement along with $200.00 Security/Damage Deposit required for completion of rental transaction. Security Deposit may be refundable after departure/inspection of property by said owner. *Owner's Cancellation Policy* Please ask the owner or check their rental agreement when booking the property.